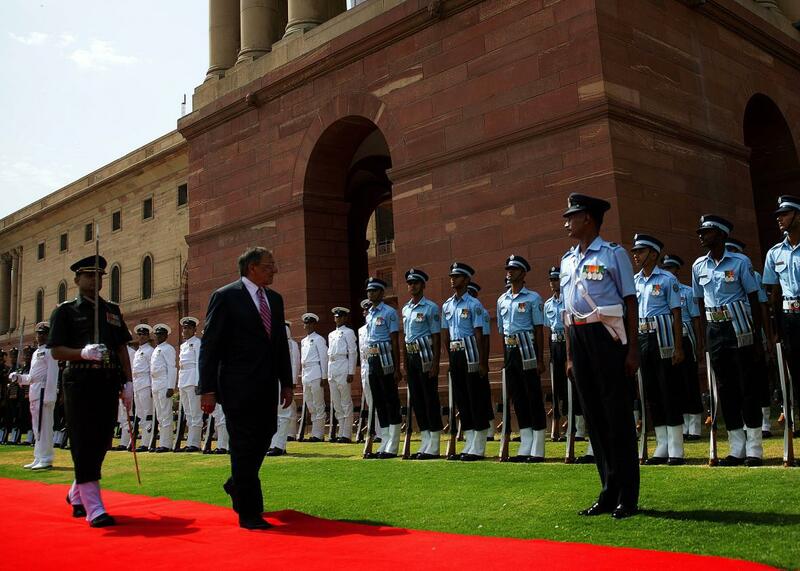 U.S. Defense Secretary Leon Panetta inspects Indian troops during a welcoming ceremony at the Ministry of Defense on June 6, 2012, in New Delhi, India. This is possible but not at all easy. For the sake of long-term analysis, let’s neglect some of India’s current weaknesses that may get resolved in 10-20 years and focus on fundamentals and their manifestations. India’s economy is projected to reach the No. 3 spot by 2020 (by at least some analysts and metrics; it’s already there by purchasing power parity), surpassing Japan, and trailing only China (No. 1) and the U.S. (No. 2). In view of China’s recent economic troubles and suspicious accounting, China’s ascent is in doubt, but India’s upward path seems more certain (say, by 2030), as its excesses have been smaller so far. Of course, India’s economy must become more robust and structurally sound, while the legal system must strengthen as well, and corruption must be addressed. Going forward, India has huge potential due to its large population, a longstanding tradition of democracy and stable government system with non-violent transitions, convenient location for trade, proximity to major oil exporters, decent standing in the world, a large English-speaking population, massive engineering education that is gradually improving in quality, and a system of research and development institutions. India’s current weakness is limited global reach. In particular, the BRICs group is looking less and less promising due to significant divergence between its members (some are in deep recession, some need oil to be expensive, while others prefer cheap oil, etc). However, the G-20 has been increasingly relevant. Should India and China reach the status of developed economies (perhaps in 20 years), they may be added to the G-7 forum. In general, faster development of the world economy should help developing countries to catch up, but in a slower world economy the developed countries will preserve their lead. India’s military is ranked No. 4 in 2015 by Global Firepower after the U.S., Russia, and China, and followed by the U.K. While this is unlikely to change by 2020, I expect Russia to drop out from the top three in 10-20 years, due to the effects of protracted financial crisis, economic stagnation, and deteriorating demographics. In contrast, both India and the U.K. are primed to significantly increase their military strength by 2025. With two new supercarriers, the U.K. will have a stronger navy (currently, U.K.’s navy is considered slightly weaker than India’s). The recently announced massive new purchase program for strike aircraft can make the U.K. air force stronger as well (it is currently judged weaker than India’s and is a lot smaller). India’s initial bet on Russian fifth-generation fighters (PAK FA) has gone sour. The supersonic cruise missile Brahmos jointly developed by India and Russia isn’t deployed by Russia for some reason (despite its availability) and does not have direct analogues in NATO countries, while NATO can technically develop one. This raises doubts about the operational effectiveness of this primarily anti-ship missile. Even today, India cannot project power away from its borders nearly as efficiently as the U.K. can (due to the U.K.’s bases and close defense relations with NATO). And India has no military alliences like NATO and the Five Eyes. India is likely to remain the No. 4 military power through 2030, but if Russia is replaced by the U.K. in the top three, this can increase India’s significance because the U.K. is a part of the already strong NATO. It’s really hard to guess the military developments by 2050, but the NATO militaries will clearly become increasingly unmanned, negating population handicaps and leveraging new technology, while other countries are likely to lag behind. The extent of this trend will be determined by specific technology developments and economic health of the countries involved. It is not clear if there will be a third superpower, especially since the U.S. and the EU are so tightly allied in most regards. But the main candidates are China and India (Russia’s economy is way too small, and its global reach has significantly shrunk in 2014-15 due to political adventurism and bad bets, while the overall trajectory remains negative). Both China and India have limited global reach today, and both are trying to reach the status of developed economies. Both need to provide better education to their citizens, improve their legal and enforcement systems, and cut down corruption. Both have questionable human-rights records, although India seems in a better shape. Both have thorny relations with some of their neighbors that are unlikely to get resolved. China has a head start on the economy size, while India has a head start on the political system. In the short term, economy is more tangible, but in the long term the political system is at least as important (as this is critical to fixing the legal system, setting up effective law enforcement, and rooting out corruption). So, will China or India be the third superpower? Or neither? International relations: Why does America continue to strain relationships with Israel by dealing with Iran? Politics: What am I to make of Vladimir Putin? Politics of India: What are the biggest problems that India is facing today?